Top: c/o Missguided. Jacket: Topshop. Skirt: ZARA. Shoes: Kurt Geiger. Now, I'd like to give you a proper introduction to one of my absolute favourite brands for statement pieces, particularly statement skirts (and don't we all know how shamefully large my midi skirt collection is?). I'll be honest - a couple of years ago, Coast wasn't a brand that filled me with excitement. It mainly conjured images of bridesmaid dresses, and not having been a bridesmaid since I was about 8, I didn't really consider it relevant to me. However, around the end of the year I'd spotted a certain black and gold skirt in a few magazines, which turned out to be by Coast. After seeing this skirt, I knew it HAD to be mine. There was no question about it. It was everything I loved in a skirt; it was full, decadent, midi-length and perfectly over the top! 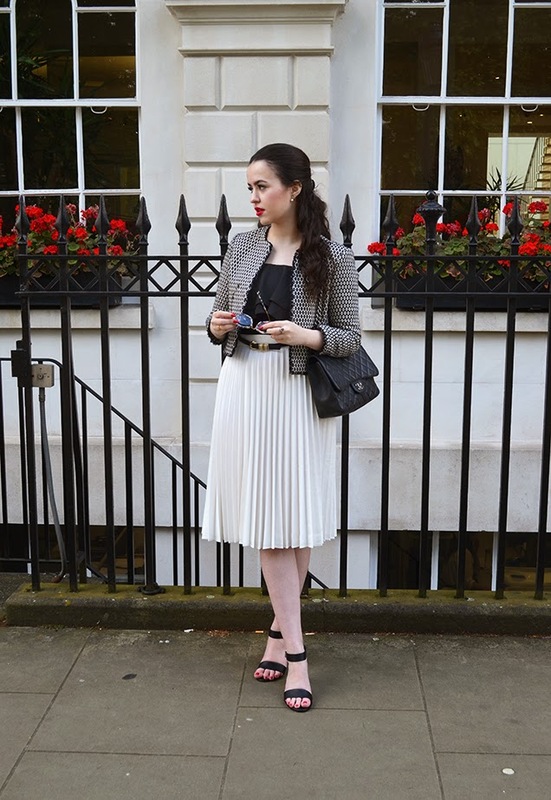 I ended up wearing that skirt to London Fashion Week in February and you can see that post by clicking here. It really opened my eyes to how much Coast, as a brand, had moved on. Ever since, I've been hooked on Coast skirts. Hooked on the designs, hooked on the flattering waistbands and hooked on the rustly sound they make when I walk. I now have four of their skirts, and you can see my wearing another one of their more colourful, floral skirts by clicking here. 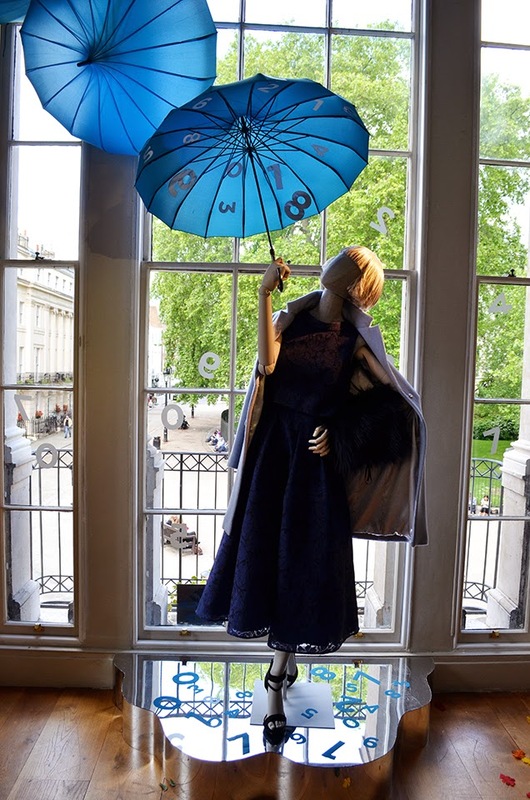 I also wore one of their evening dresses to the ballet a couple of weeks ago which you can see by clicking here! I feel like I've said the word 'skirts' too many times in this post but I have no intention of stopping. Skirts. Despite their prettiness, I fully appreciate that £65+ for a skirt isn't what at lot of people would call inexpensive. However, and I've said this before, the quality is SO fantastic, and the fits are so flattering that I really feel like they're worth the money - whether you splurge, save up for one or ask for one for a birthday present. 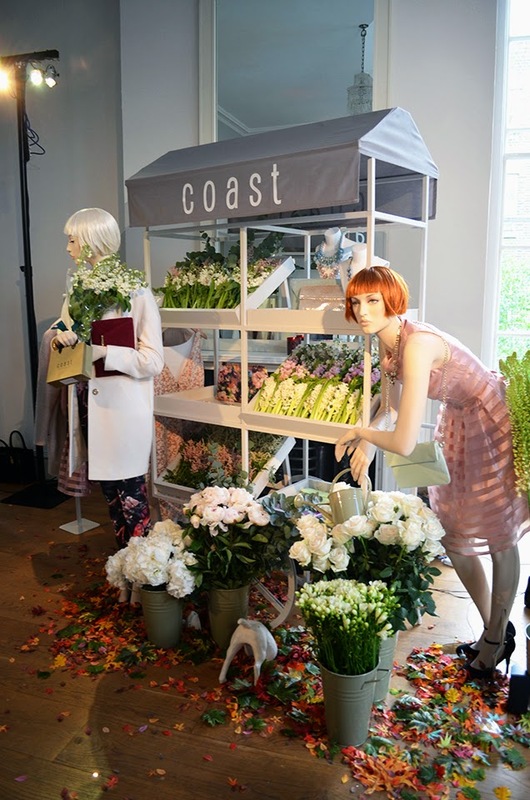 Happily, the lovely (and very friendly) ladies at Coast invited me down to their A/W Press Day a few days ago. I'm being completely truthful when I say, I've never been to a more beautiful or enjoyable press day! 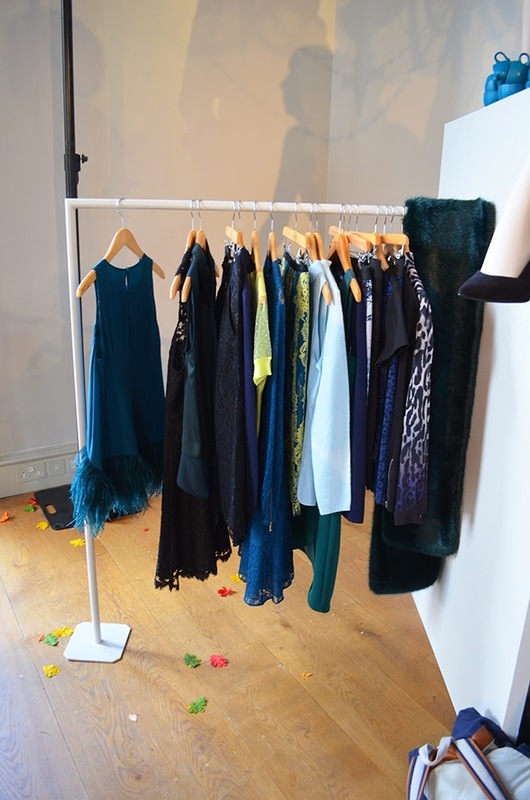 The venue was beautifully decorated, with a flower stand filled to bursting with real flowers and faux autumnal leaves scattered all over the floor, to keep to the A/W theme. As you can see, I've slightly spammed you with photos - I hope you don't mind, it was just all SO beautiful I wanted to share it with you! There are definitely a good few pieces I have my eye on for the upcoming months, I can't wait until the new pieces are released! I should also mention that despite my clear obsession, this post is not sponsored by Coast. This is my own genuine recommendation, to you! I've never given much thought to Coast before but am very impressed! 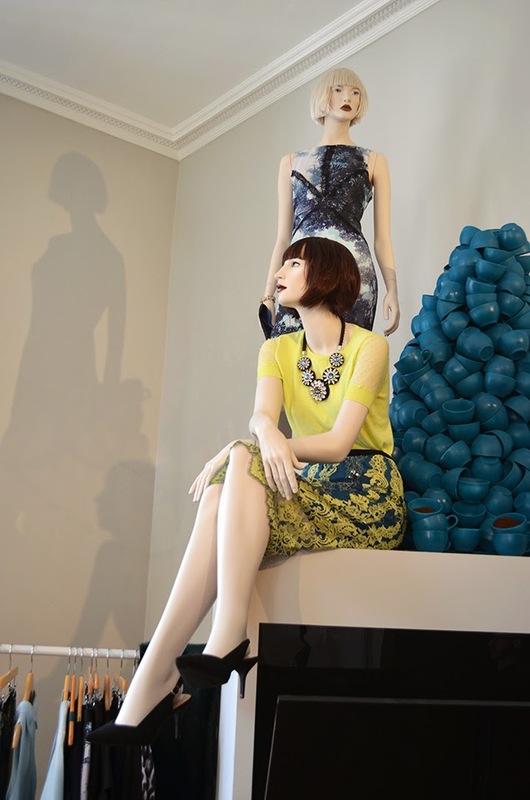 I especially love the perspex necklaces and that cute feather bottomed navy dress :) Thanks for sharing. Whoever was in charge of decorating and organizing the space needs an award. It's so beautiful! Coast's collection is wonderful as well. I'm particularly fond of that little white coat. And of course, you look fabulous as always. This does look beautiful! 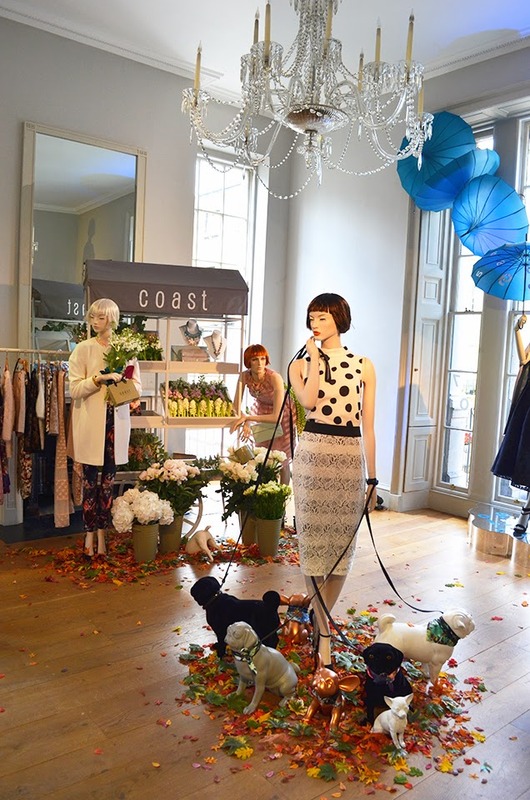 I love Coast's dresses but am yet to try their skirts, I'd better get saving my pennies! I'm absolutely loving your jacket in this.